It's like the Vive, but without the tethers. Or the PC. The dream: A virtual reality headset that can track and react to where you are in the world, without base stations or tethers. 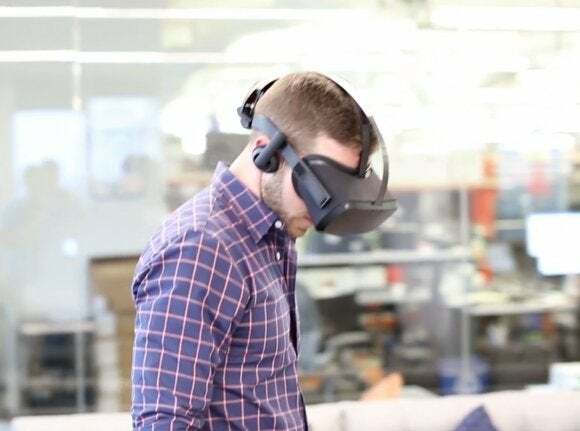 And today, at its third Oculus Connect conference, Oculus teased just that—a short, ten-second clip of a self-contained prototype “Santa Cruz” headset, complete with position-tracking. That could be huge for VR. Currently, the only inside-out headset on the market is the HTC Vive, which relies on its two Lighthouse base stations to blast an area with lasers, which are then analyzed by the headset to discern the user’s position. But the Vive’s tether? Thick, stiff, and a hassle. And it only works in a specific area. Samsung’s Gear VR (partnered with Oculus) is tetherless, by comparison. You can take it anywhere—but it can only track movement around a point, not track a user’s motion through space. Oculus’s goal is to combine the two. And they’re not alone—the Sulon Q, for instance, is a VR headset with a full-blown AMD APU inside. This vision of the future eliminates VR’s need for a high-powered gaming PC—an evolution that’s pretty much essential if the platform’s ever going to hit critical mass and become the social tool Facebook wants it to be.